Just as it enjoys an initial surge of popularity, a new social networking site called Pinterest is also experiencing its first bout of controversy. Observers are accusing the site of secretly embedding code in user content to generate revenue. In a blog entry posted Tuesday, Josh Davis detailed how the company embeds tracking code into links users post on their Pinterest pages. 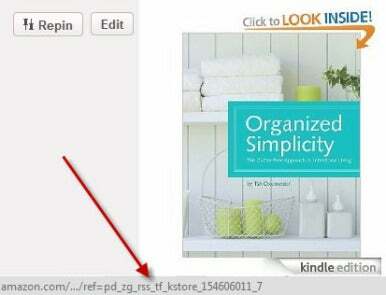 Internet marketer Josh Davis shows how Pinterest affixes its own tracking code on to Amazon links that are submitted on Pinterest pages. According to Davis, when a user posts, or pins a link to an e-commerce site that Pinterest has a business relationship with, Pinterest will append to the link tracking code for that e-commerce site. Pinterest then gets paid whenever someone purchases an item that has been pinned. Other bloggers have commented on this practice before, but it received relatively little attention prior to Davis’ own post. This practice is problematic in that Pinterest made no disclosure about the practice to its users, Davis charged. “Pinterest likely should disclose this practice to users even if they aren’t required to do so by law, if only to maintain trust with their users,” Davis wrote. Other users have expressed concern as well. “I’m more than happy to allow Pinterest to make money from my pins … But I feel like a disappointed parent … because I wish they would have just told me,” wrote BlogWorld contributor Allison Boyer. The charges are coming about as Pinterest is undergoing a massive surge in popularity. While still in a closed beta stage, the site saw almost 11 million visitors in one week in December, almost 40 times the number of visitors six months prior, reported analysis firm Hitwise. Launched in early 2010, Pinterest is already the Internet’s 109th-most-popular site, according to a live snapshot from website tracking service Alexia. And last month, analysis firm Shareaholic reported that Pinterest generated more referral traffic than social networking giants LinkedIn, Google+ and Reddit. Industry observers have attributed Pinterest’s rapid gain in popularity to the fact it was first adopted by general users rather than by the usual but smaller crowd of more technically savvy Web 2.0 early adopters. Pinterest (most often pronounced “PIN-terest”) describes itself as an online pinboard, in which users can pin items of interest, such as photos or links to news stories, into boards organized by topic. The boards, each represented by an icon or image, then can be viewed, commented upon and added to by others. The approach can offer a powerful way of organizing large amounts of information. Users shouldn’t be too surprised at Pinterest’s attempt to monetize their content, warned author Andrew Keen, whose “Digital Vertigo,” due in May, addresses the topic of how social networks use and misuse their users’ data. “There are so many controversies like this. It reflects a problem with all these social media sites,” he said, likening the outrage around Pinterest to a similar kerfuffle now unfolding around mobile social-networking company Path’s practice of uploading user address books to its server. People often fail to understand they are submitting personal data to companies “because such companies articulate their messages in utopian terms of communication and authenticity. People - and maybe even the companies themselves - forget they are businesses. Data is the new oil, and users have to be very careful,” Keen said. Pinterest did not immediately respond to a request to comment.